Providence is a great city to live in. As the capital of Rhode Island (the name originated from the beautiful Greek Island of Rhodes), it is large enough to offer excellent cultural opportunities in arts, music, and theatre (Trinity Repertory Company, for instance, has won national and international recognition) ­ yet is small enough so that urban congestion is not a problem. There are downtown stores, including the Providence Place Mall, theatres and restaurants. 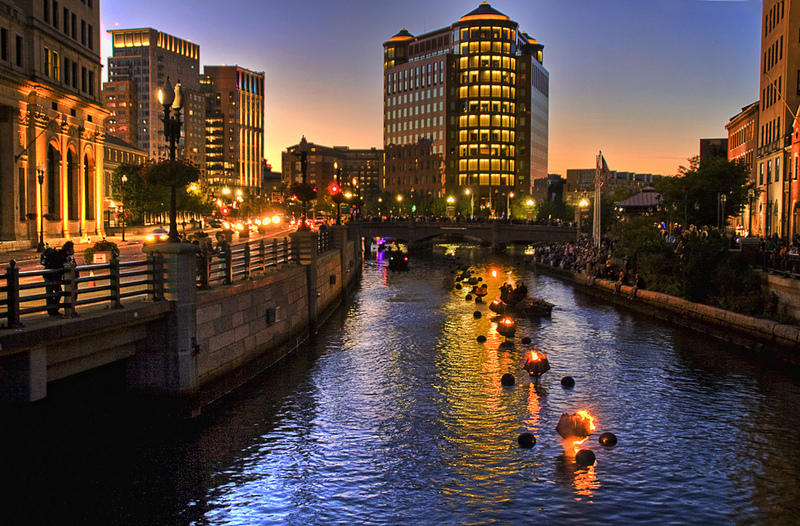 From College Hill, Waterplace Park and the Providence Riverwalk flow through the center of the capital city, serving as a focal point in Providence's downtown area and its arts events, including WaterFire, an award-winning fire installation created by alumnus Barnaby Evans '75, Biology. Gondolas and canoes are available for cruising the length of the river. In the summer and early fall, a bi-weekly WaterFire attracts many people, who come to listen to ambient music played along the river banks, and watch fires burning on pontoons in the middle of the river. 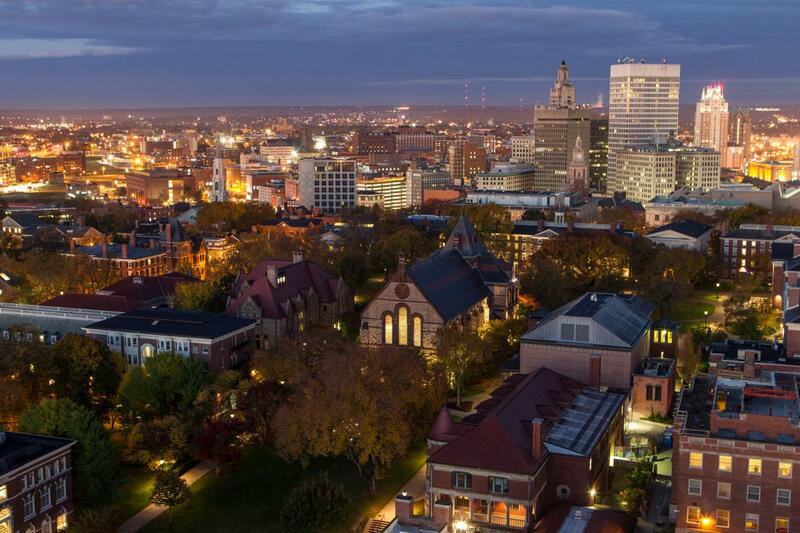 With an average population age of 29, downtown Providence is always lively and filled with crowds of young people, ­mostly students from Brown, the Rhode Island School of Design, Johnson & Wales University, and smaller colleges. In spite of its ease of access to the city center, the College Hill location of the University is residential and provides a typical New England University campus setting. Thayer Street, a popular meeting place with cafes, restaurants, shops, and a movie theatre, is conveniently located in the heart of the campus, offering the Brown community myriad options for coffee breaks, dining, entertainment, and shopping. The city of Providence is beautifully situated at the northern end of Narragansett Bay, offering magnificent bay and ocean sailing, swimming and fishing. Newport, famous for its beautiful villas, is nearby, at the southern end of the bay, with the excitement of major sailing races, world-renowned jazz, unusual music and film festivals in settings of great charm and interest. The recreational facilities in the immediate area are easily expanded. Boston and Cape Cod are an hour's drive away, and the mountains of New Hampshire, Vermont, and Maine can be reached in 3 to 4 hours. Fast Boston-New York-Washington rail line and major bus lines serve Providence, which is also connected to Boston and New York by Interstate 95. T.F. Greene Airport (15 minutes from the University) provides convenient air service to all major cities. Students will find ample apartment housing in Providence within walking or biking distance of the University. For more information on graduate housing, see: Office of Residential Life.